Ankle adventures in Albania – So where are you now? My visit to Tirana in June 2016 was only supposed to last a week. 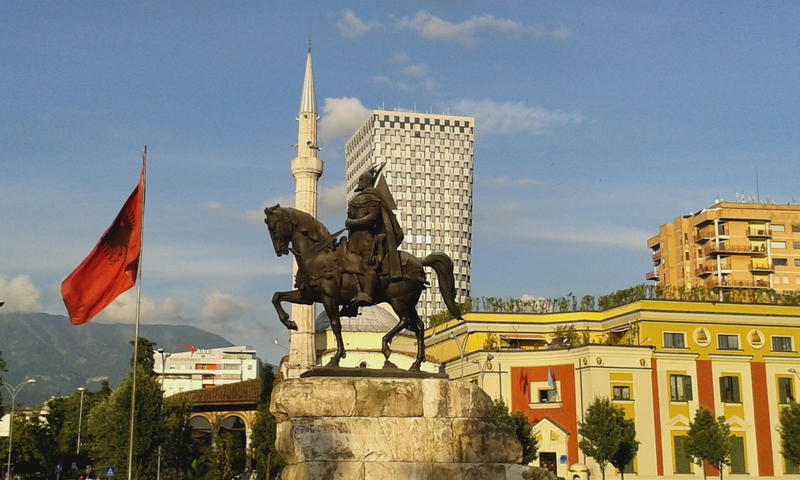 I had become intrigued with Albania, as it seems to be the black sheep of the Balkans family. Its Muslim-majority status and history (particularly as a non-Yugoslav state) seem to play a role in setting it apart, but I couldn’t understand why so many people have such negative attitudes about the place. I had frequently been told in no uncertain terms that the country was the root of all evil in Europe and full of crooks, and I was eager to find out what it was actually all about. I spent the first full day of my stay doing a mega-wander of the city by foot (which is my general routine in a new place). I was impressed by the greenery, the architecture, and the vibrant café culture and was already making a mental list of the places I wanted to return to. I was slowly making my way back to my Airbnb studio when a piece of street art caught my eye. I was so busy looking at the cool stylized map of the world that I stopped watching where I was going and missed a short but sharp drop in the pavement. As I fell I looked down and saw my right foot twist inward, which I knew wasn’t a good thing. A woman passing by immediately stopped to see if I was okay, speaking to me in English from the start. She was soon joined by a second woman. Together they helped me to my feet, and I could tell by the look in their eyes and the sincerity in their voices that they were truly concerned that I was alright. I really appreciated their reaction, as despite the fact I could still walk I was pretty sure I had done some serious damage – and was trying not to panic. I hobbled the several blocks back “home,” where I was grateful to discover an ice pack in the freezer. I wrapped my foot in a scarf (the closest thing I had to a bandage) and propped my leg up on as many pillows as I could stand, hoping that the RICE* technique would come through and make everything okay. Alas, it did not. By the next day I was in a lot of pain and could barely walk. I started researching hospitals in Tirana and reached out to my Airbnb host for advice. She was spending the summer in the city between completing degrees in the US and UK, and thankfully had time as well as access to her mother’s car that afternoon. She also of course spoke fabulous English and had a sense of what it is like to try to solve a problem in a country that’s new and completely unfamiliar. My knight in a shining white Mazda, so to speak. We were soon racing through Tirana’s streets to a private hospital that came highly recommended. As the place was making a push to attract more medical tourists, it had opened a separate office for international patients and all the forms I needed were available in English (whew). As luck would have it, that Sunday they were also having a special on orthopedic check-ups in the emergency room (it seemed a bit odd to be running specials for emergency cases, but hey – if it works for them, it definitely worked for me!). Everyone I encountered in the hospital, from the orderlies who pushed my wheelchair to the administrative staff and the orthopedic surgeon who eventually treated me was exceedingly kind. I especially appreciated that they were sympathetic without being patronizing or cloying; the offers that random staff passing by made to fetch me coffee while I waited were lovely as well. It was just what I needed as I tried to process everything that was happening and figure out what it was all going to mean for me. It turns out that I had a severe avulsion fracture that would require a cast for at least two weeks. That’s when things started to get a bit interesting. Once the cast was in place, the doctor told me I couldn’t put any weight on the foot – especially for the coming hours, when the cast was still setting. As this point I was back in a wheelchair. “So…how am I going to walk?,” I asked. “With crutches,” he replied, with a matter-of-fact tone. I waited for a moment, expecting him to add something like “And someone’s bringing them now.” However, he remained silent. Huh. Well, it turns out that crutches are something you have to procure yourself. I’m not sure if this is standard in Albania, but the fact that I seemed to be the only one confused led me to believe it is. That wouldn’t be such a problem if it weren’t for the fact that I seemed to need crutches to go buy crutches. That and the fact that at 6’3”/190 cm I’m quite a bit taller than the average Albanian. The pharmacy on site only had what seemed to be child-size crutches, but the entire staff seemed eager to contribute to a conversation with my host concerning where we might be able to buy said crutches. In the meantime, they loaded me up with a box of syringes full of a blood thinner I apparently needed to give myself daily to avoid blood clots. This was all just getting too fun for me to handle. After getting lost a few times, my host and I finally located a medical supply shop rumored to have crutches in my size. However, the next hurdle was that we could only find parking two blocks away. I had no choice but to hang on to my patient host and hobble along the best that I could, trying to walk on the very tips of the toes on my right foot — which must have created a amusing diversion for passing traffic. It was worth the effort, however, and when the lovely saleswoman in the shop returned from the storeroom with a big smile and XL crutches, I nearly hugged her (which I didn’t do, as I probably would have fallen on top of her). Victory! Once I was back in my flat, I had to figure out a whole series of new routines and techniques. I thankfully only had to go up a few to get in, which seems rare in Tirana – I’ve truly never seen a place with so many stairs. Preparing food and eating was the next big challenge. The kitchen wasn’t that large, but the sink and fridge were on one side and the stove on the other – and a few steps were required to move between them. I had so many near misses of sending dishes or myself flying that it ceased being funny, but I eventually got the hang of it. I also resigned myself to eating standing, as there was no way I could carry anything far enough to sit down. Interestingly, it’s a habit I kept for many months without even realizing it. Buying food and water turned out to be an even bigger challenge. There were some shops within a few blocks of the flat, but when I was still getting used to my crutches – and the extremely hot summer temperatures – it was truly an adventure. When I mustered the courage to venture out, I was surprised at the number of old women who stopped me seemingly to express their sympathies. None of them spoke any English, but they spent a lot of time pointing at my foot and then raising their hands up to the sky and shaking their heads. Under other circumstances I might have found it a bit annoying, but they really seemed genuine and well meaning. It was like having my own posse of Albanian grandmothers keeping an eye on me. I couldn’t actually make it into the stores, as they had – you guessed it – stairs. Stairs without railings and loaded with six-packs of large water bottles, nonetheless. There was simply no way I could make it. So, what did I do? I stood at the bottom of the stairs with money and a short list of what I needed (thank you, Google translate), waiting for someone walking by or a shopkeeper to figure out what was going on. When my proxy shopper returned, I then had to ask him or her to load everything into my backpack so I could shuffle back home. Being so reliant on the kindness of random strangers was one of the most humbling experiences I’ve ever had. Everyone was fabulous, though, and not for a minute did anyone make me feel that I was some sort of a foreign freak asking them to do something insane (which was sort of what was going on in my own head). I was – and remain – grateful. I had been able to prolong my original one-week stay in the flat for four or five extra days, but thereafter it had been booked by someone else and I had to move on. After a lot of searching for a place without a significant number of stairs – and preferably with a lift – I finally found a room in the flat of a young Albanian lawyer that I could book for a month. Once settled in the new digs I again started the process of developing strategies for coping with day-to-day life (which included subscribing to Netflix for the first time and binge-watching Orange is the New Black, which I’m sure was very therapeutic). The neighborhood was a bit more frenetic, but just as full of people who were willing to help. For instance, on my first venture out in search of groceries the owner of a nearby hotel spotted me wandering around and insisted on walking me to the store. When we discovered that it had another set of impossible stairs, he immediately called one of his employees to come and do my shopping (which he had actually suggested from the start; my default position of self-sufficiency had just prevented me from accepting the offer). Just…wow. Once the cast came off, I was a bit more mobile – but I was still dependent on my crutches. The people who worked in the bakery, produce stand, and grocery store closest to home and I developed systems that were as efficient as possible (despite the lack of a common language and with a great amount of gesticulation), and I was able to get all of my basic needs met. One funny thing I started doing was to mimic what I had seen many older people in different Balkan countries do, namely to hold out a handful of change to the cashier and let him or her take the correct amount – which was just easier than trying to count out unfamiliar coins while keeping my balance. None of the cashiers even batted an eye. My wonderful host and flat mate was also great about helping me sort things out; in return I taught her random new English terms such as “Ace bandage” (which I hope she will never need to use again!). I also made friends with a taxi driver who was based at the end of our block. His English was quite good, and even though he asked all of the standard yet still somewhat creepy questions that all solo female travelers seem to get in many parts of the world (starting of course with “Are you married?”), I felt like I was in safe hands. Seeing his somewhat battered Toyota drive up to the main entrance at the hospital after I had had my cast removed gave me a hell of a lot of comfort. After nearly six weeks in Tirana, even though I was still on crutches I knew it was time to leave. My world was very small for those weeks (some days I didn’t even leave the flat), and I knew the only way I could get a sense of real change was to move on. My host summed it up perfectly when she said – with all of the very best of intentions – “I can’t believe you’re leaving – it’s like you’re part of the furniture!” Yes, that’s indeed how I felt. It took me several months to fully recover and be able to walk on my own, but I got stronger with each move – aided undoubtedly by the psychological satisfaction of reclaiming my life and mobility. Having an incapacitating injury when I was travelling on my own in a country where I didn’t know the language, culture, or local systems was certainly not the most joyous experience I’ve had. Once I got over the initial panic and indulged in a little self-pity, however, I realized that things really weren’t as bad as they could have been. I had great living situations with hosts that went out of their way to assist me and encountered a whole slew of individuals who were kind, understanding, helpful, and sympathetic. I also received great medical care at very affordable prices and had plenty of fresh, healthy food in close proximity. Moreover, I was able to get a lot of work done and had the whole damn internet to distract me when I needed a break. To top it all off, I was in the one country in Europe that allows US tourists to stay up to a year without a visa (which meant I didn’t have to worry about the immigration clock ticking) and didn’t have any set plans or bookings post-Albania. It truly could have been far worse. The experience has also had some positive repercussions on my thoughts and attitudes, which has included trying to not take things for granted and being more helpful to strangers myself. For many months I thought that I wasn’t really in a place to comment on what Albania or Tirana is “like,” given the very limited exploration time I had before my accident. However, I’ve since come to realize that my experiences actually make me much more qualified than someone who just breezes in and runs through a checklist of things to see and do. I had a chance to glimpse into the hearts of Albanians, and I was treated far better and with more dignity than I’m afraid a non-English speaking tourist in a similar situation would be in many major US cities. I am just as grateful for this opportunity as I am for all of the assistance and kindness that people extended to me. I’ve become a staunch defender of Albania, and a real rooter for this Balkan underdog. I look forward to returning to see even more of what it has to offer in the years to come. And in the meantime, dear Albania, my ankle and I salute you – stairs and all. * RICE: Rest, ice, compression, and elevation. Common advice for immediate treatment after an ankle injury. Wow, definitely an adventure, though perhaps not the kind one would choose to repeat! I agree with one of your last statements – that the experience definitely gives you more of an insight into Albania than someone who breezes in and out like a regular tourist. Wonderful post and beautifully recounted!